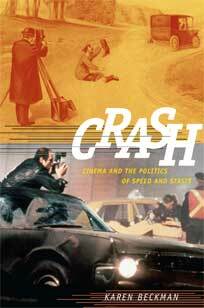 Crash: Cinema and the Politics of Speed and Stasis. Since the industrial revolution, technology has completely altered ways of living. In the twenty-first century, a deluge of new technology has continued to crash into our daily lives, altering modes of communication and commerce. Our lives are increasingly split between the digital and corporeal. Sometimes there is no clear distinction between the two. Writing within this structure of feeling, Karen Beckman’s Crash: Cinema and the Politics of Speed and Stasis takes an innovative, interdisciplinary approach, looking at how the car crash can be used as a way to “explore tensions that exist at the heart of the film experience: between stasis and motion, body and image, proximity and distance, self and other, and inside and outside” (p. 1). Although she is undoubtedly interested in cinema and the film-going experience, Beckman asserts her multidimensional approach, stating that she “hope[s] to emphasize, rather than explain away, cinema’s impurity at a time when some critics, especially within the field of art history, are calling for a renewed focus on the medium, a parallel reinvigoration of traditional epistemological structures, and a disciplining of the messy field of cinema studies” (p. 1). Throughout her seven-chapter book, Beckman, Professor of Film Studies at the University of Pennsylvania, presents a thoughtful analysis of how car crashes have been pivotal within twentieth and twenty-first century culture. However, Crash also showcases a refreshing, innovative way to explore and analyze culture, while engaging texts and theories from a variety of disciplines. In the introduction, Beckman explains her approach and how she intends to engage the car crash throughout Crash. She states, “I ask why artists, writers, and filmmakers—including Cecil Hepworth, Andy Warhol, Jean-Luc Godard, Ousmane Sembène, J.G. Ballard, Alejandro González Iñárritu, and Nancy Davenport—have repeatedly turned to immobilized and crashed cars as they wrestle with the political, ethical, sexual and aesthetic conundrums of the modern world” (p. 7). Using a variety of texts that are on the borders of different kinds of media (film, photography, literature), Beckman takes inspiration from a number of scholars, but is noticeably influenced by feminist writers, particularly Judith Butler and Susan Rubin Suleiman. Beckman’s first two chapters examine car crashes in early silent film and slapstick comedies from the 1920s. Building from Walter Benjamin’s One Way Street (1928), Tom Gunning’s writings on early cinema, and a 1926 essay by Virginia Woolf called “The Movies and Reality”, Beckman connects the invention of cinema, with the automobile. For Beckman, cinema and the automobile are two connected technologies that symbolize the modern world. However, in the early twentieth century, both the automobile and cinema were also regarded as faulty technologies that often broke down and failed. Beckman notes the peculiar ironies of cinema and the automobile, noting that while both revolve around movement, they are also technologies of stasis—cinema is series of projected frames, automobiles confine travelers within a small space. Beckman builds off this notion, pointing out that with the rise of film and the automobile, filmgoers frequently saw “cinematic fantasies, social visions, and experimental aesthetics that have emerged in conjunction with the early automobile as a malfunctioning technology, one that fails to start, crashes, explodes, falls apart” (p. 28). Just as early films caught on fire or failed to work properly, within these works, the car is often a source of comic relief in early cinema. Beckman uses several early films to explore this notion, including How it Feels to Be Run Over (UK 1900) Explosion of a Motor Car (UK 1900), and The ‘?’ Motorist (UK 1906). However, she also contends that in addition to being a source of comic relief, the automobile and cinema were two technologies with great potential. Just as the automobile was able to accelerate travel speed, cinema was able to capture these movements of the modern world. Beckman continues her study of silent comedy into the second chapter, noting that by the 1920s car crashes and automobiles in film take on a more complex role. Automobiles in these works highlight private versus public space, changing gender roles, consumerism, and the dangers of the modern world, particularly on the road. She specifically examines these notions within two films, the Harold Lloyd film Hot Water (USA 1924) and Laurel and Hardy film Two Tars (USA 1928). In contrast to silent comedic cinema, Beckman also studies industry-sponsored automobile films from the 1930s-1960s, examining how safety, risk and responsibility function within these works. Before analyzing these texts, Beckman crafts a theoretical discussion of responsibility, social disorientation and citizenship, drawing upon the writings of Paul Virilio, Maurice Blanchot and Judith Butler. She continues on to argue that these industry-sponsored films “constitute important sites for historicizing a social, political, and corporate engagement with the question of how to regulate (and exploit) the relationships among human responsibility, technology, automatism, and desire” (p. 118). For Beckman, these films provide consumers a useful way to understand automobiles and learn how to be “safe drivers”. However, she also points out they are schizophrenic texts where the messages conflict with the audio and visuals. One of the most interesting examples she gives is from a film called The Other Fellow (USA 1937). Beckman notes that while this film suggests consumers be safe drivers by being aware of their fellow drivers, the visual landscape of the work shows a “divided and fragmented self” that doesn’t act logically with its surroundings (p. 123). In addition to analyzing a handful of these works, Beckman interestingly relates these industry films and their juxtapositions of speed and stasis, safety warnings and fragmented visuals to the works of avant-garde artists like Stan Brakhage, Robert Rauschenberg, Marcel Duchamp, and Andy Warhol. Perhaps two of the most intriguing chapters of Crash are Beckman’s analysis of Andy Warhol’s film Since (USA 1966/2002) and J.G. Ballard’s avant-garde 1973 novel, Crash. Spending a chapter on each, Beckman explains how these works (and others like them) showcase the car not only as a device for escape, but one of entrapment, social control, stasis and death. Moreover, she points out that Warhol uses John F. Kennedy’s assassination and Ballard uses sexualized car crashes to raise questions about identity and time. Additionally, Beckman highlights that these works function on an avant-garde level, pushing their medium (film and literature) to its boundaries. Beckman notes, “Just as Warhol explored film’s relationship to television and photography in Since through a very specific car accident, so Crash probes the limits of literary form and language in relation to the adjacent media of photography and film; and as Warhol does in Since, Ballard employs the language of collision to describe a movement between media that becomes intricately intertwined with the language of sexual difference and desire” (p. 166). The final two chapters of Beckman’s study examine car crashes in relation to González Iñárritu’s Amores Perros (Mexico 2000) and Godard’s Weekend (France 1967). These thoughtful analyses provide readers with new insights into these dense and complex films. Beckman is particularly interested in showcasing how these works exhibit the notion that “we are never outside the space of capitalism, we are always in a space where the tension between still and moving images refuses to resolve itself” (p. 189). These films require its viewers to be aware of their world through a series of mediated images. Beckman pushes her reading of Godard’s film even further, comparing Weekend to the photographs of Nancy Davenport; images where car crashes and sites of protest and/or trauma are shown through the lens of different media. Using these two artists, and reflecting on the other works she’s analyzed throughout Crash, Beckman encapsulates the importance of the cinematic car crash. Beckman writes, “The cinematic crash represents ideological and aesthetic impurity, hybridity, and uncertainty….it persistently turns our attention toward film’s collisions with other media….And even at its most clearly experimental and critical, the cinematic crash never quite manages to escape its affinity with the capitalist commodity culture of cars, disaster spectacles, and territorial expansion” (p. 232-233). As a whole, Beckman’s book takes a refreshingly creative approach. While it explores the social significance of automobiles in cinema, it differs from studies of Road Movies by exploring how automobiles and crashes have been used to not necessarily show the freedoms of this technology, but its dangers, risks and failures. Crash is a rich text that provides readers with new ways of thinking about specific works and the car crashes within them, but also a unique way to approach a scholarly study. Moving beyond one discipline of study, Crash is an exemplary piece of scholarship, drawing from art history, cinema studies, comparative literature, cultural studies, and media studies. Beckman crafts a thoughtful, engaging text that pushes scholars into thinking differently about the how to engage cinematic texts and how cars (and crashes) have played a pivotal role within twentieth and twenty-first century political and cultural life.